The provider was very professional and took the time to identify my needs. Also, I received great care and was seenright away. 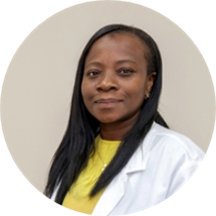 Focused and caring, Ms. Koudiratou Radji believes in providing effective and compassionate patient care. She is a passionate nurse practitioner and encourages her patients to discuss their concerns candidly. She can also converse fluently in English and Yoruba. Ms. Radji is available for exams and consultations at her own practice located in Berwyn Heights, MD. She received her master’s degree in nursing from the University of Maryland. She is a member of the American Academy of Nurse Practitioners. She manages a wide array of patient concerns, such as stress, stomach ulcers, vascular diseases, and pediatric fungal infections. Ms. Radji's philosophy of patient care is based on compassion, efficacy, and teamwork. She focuses on giving patients the highest quality of care while guaranteeing their participation in managing their own medical condition.